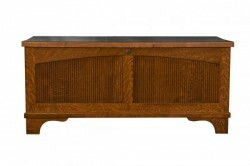 An old fashioned piece of furniture that still lives on due to it’s practical purpose in many modern homes, the Cedar Chest is perfect for a wide variety of storage needs. Cedar Chests are found in foyers, mudrooms and bedrooms and can provide seating and an easy place to store everything from boots and shoes to sweaters and keepsakes. The Cedar Chests at Amish Originals can be customized to suit both the décor and the space needs of your home; size, stain color, style and wood species can all be individualized as your chest will be made-to-order. Amish Originals works with more than 70 of Ohio’s very finest Amish craftsmen who, with generations of experience, produce a fine quality product that is built both for beauty and longevity. 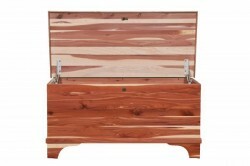 All of our chests are built with Cedar and fronted with solid America hardwoods like Maple, Quarter Sawn White Oak, Red Oak or Cherry—all of which have been sourced and harvested with environmental sustainability in mind. 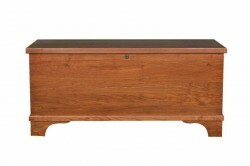 If you’re looking to add a versatile seating and storage piece to your home, consider a Cedar Chest from Amish Originals. 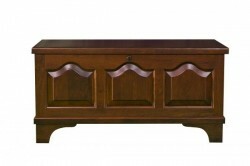 Call for a quote today or drop by our Westerville, Ohio showroom to see the quality of our Amish-made furniture. Shown in Cherry with waterfall top.